The average American spends nearly 90 percent of their time indoors, where air pollutants can be two to five times more concentrated than outdoors, putting people at risk for severe health complications, according to the Environmental Protection Agency. The World Health Organization reports that, every year, more than 2.5 million people die from indoor air pollution caused health complications, such as chronic pulmonary obstruction diseases, stroke and lung cancer. Volatile organic compounds are hazardous air pollutants often emitted from common household objects, such as disinfectants and paint, and even in offices from copiers and ceiling paneling. Having better indoor air quality requires better monitoring technology. 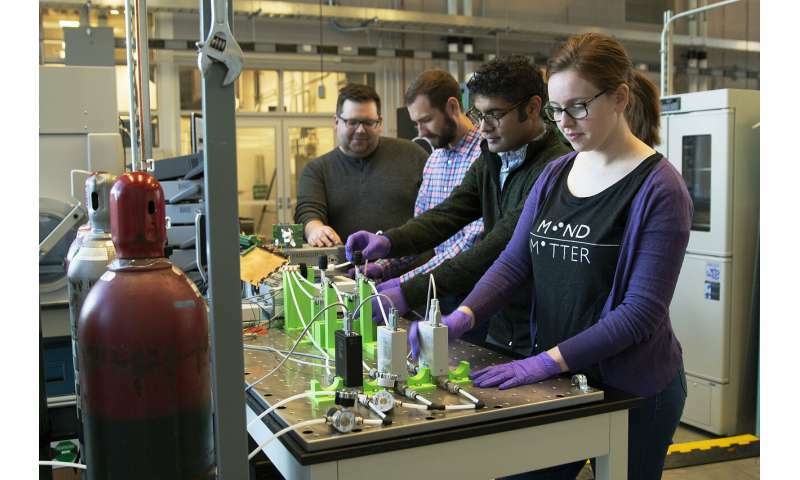 That's why Purdue University researchers are developing novel resonant sensors that can detect volatile organic compounds polluting indoor environments at dangerous levels and could potentially prevent the related health complications. "We started looking at how you can transition this sensing technology from the lab into a practical tool for personal or building-based protection," Rhoads said. "First, we looked at public safety applications, where we ran into many bottlenecks associated with the lab-to-field transition. Based on the lessons learned, we were eventually able to develop a technology that had a broad purpose." "The sensor on the market are not small enough, low power enough or sensitive enough to meet the emerging applications," Rhoads said. "These limits affect public health, because the human body can experience health complications from volatile organic compounds at much lower levels than what many of the existing cost-effective monitors can easily detect." "It's one thing to make a new technology, but to create public interest in a product they've never bought before is a non-trivial task," Rhoads said. "There are constraints in what the market will accept, which leads to interesting research questions about reliability and low-power consumption." "Our work's goal is developing low-cost volatile organic compound sensors capable of identifying indoor air quality problems and capable of controlling ventilation in response to high indoor emissions," Braun said. "Sensing indoor volatile organic compound concentrations and then adjusting ventilation accordingly can maintain acceptable levels, but current sensor technologies are much too expensive for this purpose." The team is also working on a similar technology that detects carbon dioxide emissions in order to limit unnecessary ventilation when buildings have low occupancy leading to reduced energy consumption and energy bills in homes and offices.